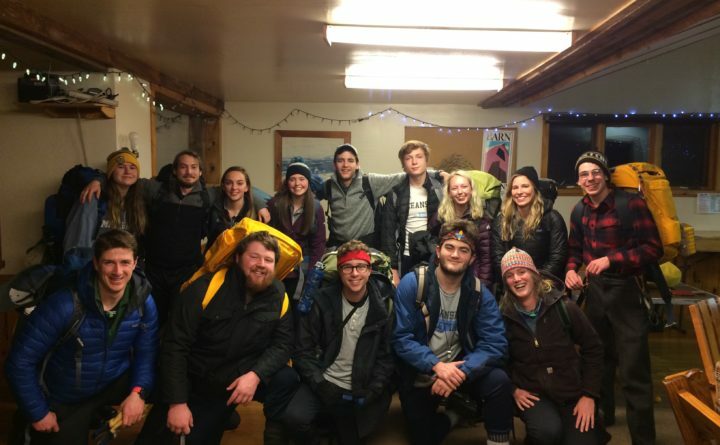 Nine 12th graders from Team Patagonia completed the Trekkers Rites of Passage program, bringing closure to their six-year Trekkers experience and helping them move to the next phase of their life. Trekkers’ Program Manager Hannah Tannebring, with the help of a team of dedicated volunteers and Trekkers staff, led nine seniors on the five-day Rites of Passage Expedition starting on March 15. The entire group was grateful to former Program Manager, Emily Carver’s leadership of these students through the first three years of their Trekkers journey. This Rites of Passage expedition included a 36-hour wilderness solo at Stump Sprouts in Hawley, Massachusetts. Each student camped alone on their solo, while being asked to reflect on their high school years and Trekkers experience, as well as preparing mentally for life after high school. Students were given reflection topics and encouraged to journal, focusing on who they want to be in their lives moving forward. During their solo, they spent time reflecting and coming up with a mission statement for their life. The weather was very cold, and students endured single-digit temperatures on the final night of their solo. All nine seniors completed their solos. On their final day, certificates and whistles were handed out that say “live in the moment”, and act as a reminder that each person is the leader of their own life, and when they need something, any one of them will come running. This program oftentimes provides the first opportunity for young adults to purposefully disengage from technology, family and social life in order to focus their attention inward before a major life transition. Activities before and after the solo experience encouraged that reflection, focusing on goal setting and self-definition. A major component of this process of reflection was volunteer and mentor participation, with all volunteers having worked with this group of students in varying capacities for the last six years. The 12th grade expedition is the final program in a student’s Trekkers experience. This program is designed to help students focus on life beyond high school, giving them a greater understanding of how to make the transition from adolescence to adulthood, and from being fully dependent to completely independent. Trekkers is a non-profit, outdoor-based mentoring program that connects young people with caring adults through expeditionary learning, community service and adventure-based education. Trekkers serves 7th through 12th grade students from the six communities of Cushing, Owls Head, Rockland, South Thomaston, St. George and Thomaston. For more information about Trekkers’ Rites of Passage Expedition, please visit www.trekkers.org or call 207-594-5095.